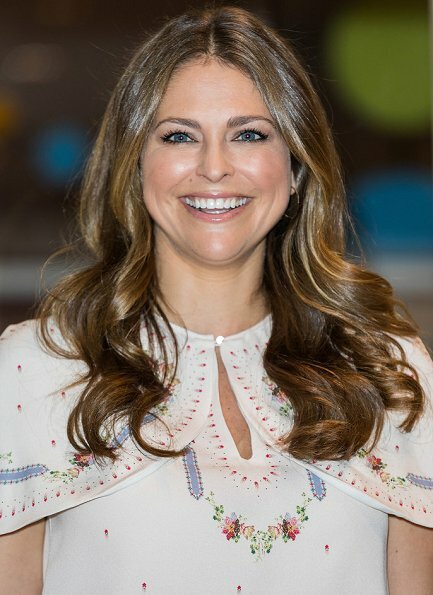 On February 14, 2017, Princess Madeleine opens the "Room for Children", a Swedish library with children's books from the Nordic countries at the Southbank Centre in London. Room for Children is a Swedish library concept with the child in focus. Madeleine looks so beautiful and stylish. Love her blouse. That lovely blouse is from Vilshenko! very clever i like fashion too well done your right. I am all for promoting literacy, but Madeleine's outfit is dreadful. Beatiful blouse but this skirt doesn't look good on her. The blouse is beautiful, but the skirt and the boots - no! I like nothing here, not the 'look I'm wearing something really special' blouse, not the granny skirt, not the ankle boots, that make any legs look short and fat. And all three together look simply blah. Agree. There is a limit even for pretty women as to what ugly clothes you get away with. This is awful. Full stop. Unfortunately, for daytime outfits anyway, Madeleine favours edgy looks that are neither classicly elegant (as would be good for a royal) nor timelessy chic. Most of what she wears will look dated very soon, and not even her beauty will stop me from cringing at most of her choices. When those choices look blah right away, without even being dated, then something´s not right. Too bad. She has such great potential. Not a good look for Madeleine, the blouse is very pretty but it looks odd paired with a black skirt, and the ankle boots don't look right either. A pair of pumps would have looked way better. I believe it is a nod to traditional Swedish dress since this is a Swedish children's room. There were plenty of ways that Madeleine could have incorporated traditional Swedish dress into her outfit, but that outfit wasn't working for her. It was mismatched, the top half has a prairie bohemian feel to it, and the bottom half looks too edgy with the black skirt and suede ankle boots. Not a good outfit I feel. A big nod to her homeland. I like the update in a way only Madeleine can deliver. I am sure the boots are for weather and comfort. Maybe her big sis will try a pair of boots for national day this year?!? Doubt it! I might be wrong but I got the feeling that she is pregnant. She is glowing. Absolutely beautiful, though I don't like her skirt but it's London where fashion is always more extravagant. Her hair is just amazing and she is smiling a lot which makes her a real beauty queen. She does not look good in this. The skirt is just frumpy and the blouse is too folkloric. And there is no way that short boots look good with a fullish and midi length skirt. There's no style at all here. it's awful what she is wearing together! I am not used to that with Madeleine! Auts, this is completely miss. She is beautiful and work more than the goody-goody sister. Crown Princess still on holiday??? Madeleine works more than Victoria? I think you've got that backwards. Madeleine is the one criticized the most because she barely does any work. Crown Princess Victoria works less than her parents. Prince Carl Philip works less than CPss Victoria. Princess Madeleine works less than Prince Carl Philip. Reining couple is the most important and others who follow go lower on their importance. In Sweden maternity leave is about one year to mother so Victoria is still having it. Obviously Madeleine is gorgeous, but I'm not feeling this ensemble. I like all the pieces individually; they just aren't cohesive. Oh dear... Such a beautiful young woman, but a stylist would be helpful. Ditch the fur-thing too, please. Reminds me of operetta "Countess Maritza". Back to the basics. Taste is not a question of money. That is all I can muster up today. Well I posted and nada. This is the 5th post that does not appear. But Diane, we need you here! Do not leave! Diane , maybe just glitch online. I think I am taller than you so I will drag you back...Ha Ha Ha ! Diane, I find sometimes it's a technical thing. My posts from my laptop don't appear sometimes because I have to click "publish" a second time which isn't needed with my iPad. I hope your day is going better! She's very pretty. her eyes are beautiful, but I feel her whole outfit does nothing for her. Is she pregnant? Her waist seems to have thickened, and in the 3rd picture it looks like she has a slight bump. Yes, I can see that also. Princess Madeleine looks gorgeous even with that mumsy skirt. Love those delicate flowers on the top and cape overlay added to the feminine feel. Her hair looks amazing: so glossy and shining. I was quite surprised to read your comments on how bad this outfit looked. I must have been the only one who liked it and found it appropriate for the event ;-D Why? Because the blouse looked very elegant and romantic, by teaming it with the longer skirt she could easily sit down on the floor with the children (with shorter skirt she would have bared too much flesh). I disliked the boots but its winter in London, so it can be forgiven.